https://2019mfspringconcert.bpt.me or at the door. As one of the oldest community-based flute choirs in the San Francisco Bay Area, we strive for a harmonious environment where all members contribute equally and are treated with respect. MagicFlutes was formed in 1980 when Music Director, Pamela Ravenelle joined the faculty of Canada College in Redwood City. At that time, Ms. Ravenelle was still a student herself, completing her Master of Music Degree at the San Francisco Conservatory of Music. Today, Ms. Ravenelle has a full schedule of teaching privately in addition to directing MagicFlutes. MagicFlutes started as a flute trio and today has 29 flutists playing piccolo, c-flute, alto, bass and contra flute. The group has grown steadily over the years and flourished by encouraging the development of artistic excellence among our membership. Our flute orchestra provides an outlet where professional flutists, teachers, adult amateurs and students can gather to share our love of flute playing and performance. Our multi-talented group of MagicFlutists includes musicians with who work in advertising, medicine, education, law and science when they are not playing their flutes. We are all united by our love of the flute and our love of making music. MagicFlutes rehearses once a week at The College of San Mateo, and performs regularly in the San Francisco Bay Area including the Filoli Mansion in Woodside, the Morrison Planetarium in San Francisco, The Piccolo Pavilion in Corte Madera, Burlingame Country Club, Brentwood Art, Wine and Jazz Festival, Foster City Community Center, Bach Dancing and Dynamite Society, and we were invited to perform at the National Flute Association’s Conventions in Las Vegas in August 2003 and in Anaheim in August 2010. 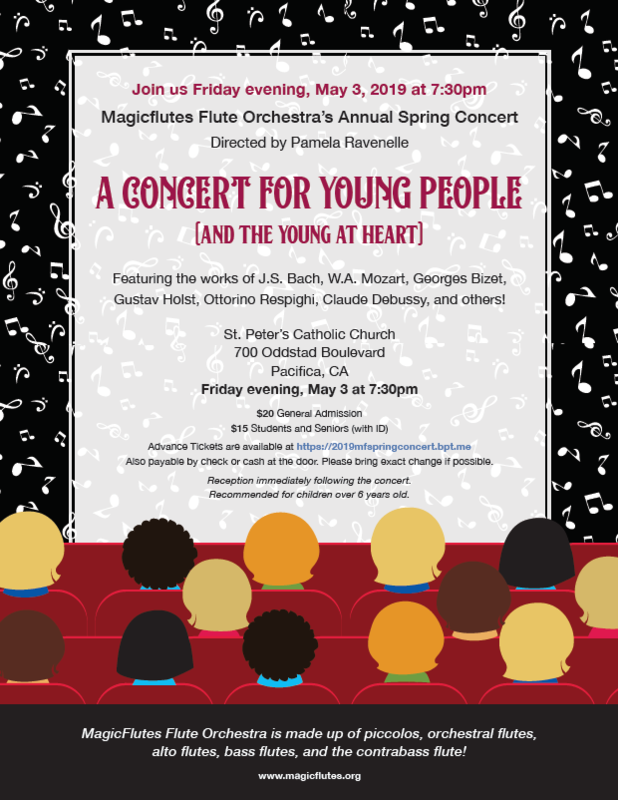 In addition, The MagicFlutes have performed many “outreach” concerts in the Palo Alto and San Mateo School Districts. 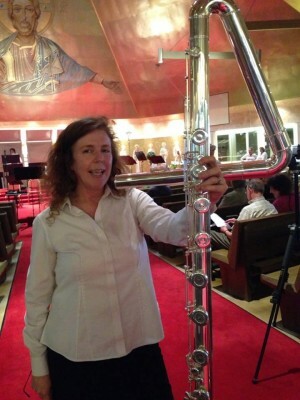 Magicflutist Diane Carroll and our Contra Bass Flute! In addition to our concerts, we perform at various community gatherings throughout the Bay Area. We’ve commissioned works and have performed pieces arranged by our own choir members. Through fundraising over the years, we acquired a contrabass flute for the group. This new addition provides a bass sound that adds a bit a “magic” to the MagicFlutes sound allowing us to perform many orchestral works.